This isn’t your old college library. I recently took a tour of N.C. State University’s brand new Hunt Library with the N.C. Association of Government Information Officers (NCAGIO). 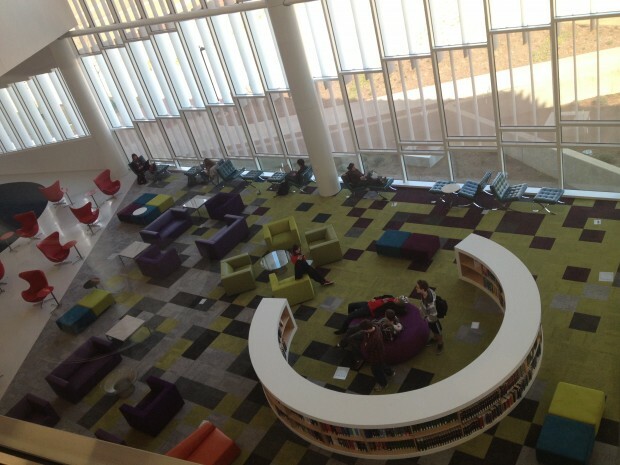 The technology, innovation, and design of this library blew me away. We started at the BookBot: a several-story tall, automated storage and retrieval system that holds most of the library’s inventory. Then, on the main floor, the circulation desk has been replaced by an Apple Store-like “Ask Me” alcove, where students can borrow everything from flash drives to laptops to storage lockers. Throughout the building, the architecture and furniture work together to create a simple yet high-tech atmosphere. The walls near stairs, elevators, and bathrooms are color-coded for easy findability; and group study rooms, media rooms, a video game laboratory, and 360-degree customizable galleries are all outfitted with the latest technology. A 3D printing lab is even available for students to design and create 3D models. Built through state funds and private donations, the Hunt Library is on the cutting edge and will serve as a cornerstone of student life on Centennial Campus. The best part is that the library is open to the public (hours), with free tours each week. Definitely go check it out!